In these lessons, we will learn some formulas relating the angles and the intercepted arcs of circles. Measure of a central angle. Measure of an angle with vertex inside a circle. 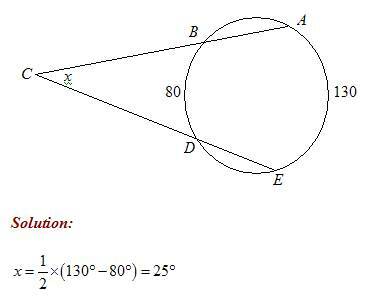 Measure of an angle with vertex outside a circle. We will also learn about angles of Inscribed Triangles and Inscribed Quadrilaterals. 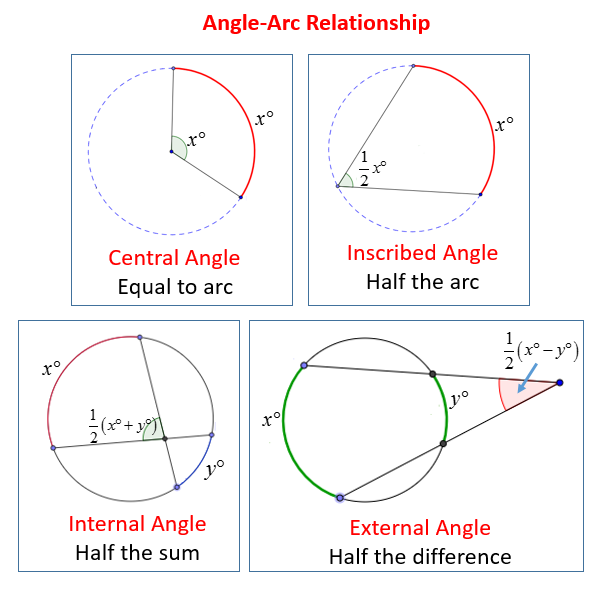 The following diagrams show the relationships between the Angles and their Arcs: Central Angles, Inscribed Angles, Internal Angles and External Angles. Scroll down the page for more examples, explanations and solutions. What is a Central Angle? A central angle is an angle with its vertex is at the center of the circle and its sides are the radii of the circle. What is the relationship between central angles and their arcs? The measure of a central angle is equal to the measure of its intercepted arc. A chord is a segment that has is endpoints on a circle. The diameter is the longest chord of a circle and it passes through the venter of a circle. A line is called a straight angle and it forms a 180 degree angle. A central angle is an angle with its vertex at the center of a circle and its sides are radii of the same circle. Show that central angles = arcs they intercept. Examples to show how to use the property that the measure of a central angle is equal to the measure of its intercepted arc to find the missing measures of arcs and angles in given figures. What is an Inscribed Angle? An inscribed angle is an angle with its vertex on the circle. What is the relationship between inscribed angles and their arcs? The measure of an inscribed angle is half the measure the intercepted arc. This video deals with angles formed with vertices on the circle. Examples of how to use the property that inscribed angles are 1/2 the measure of their intercepted arcs to find missing angles. The measure of an angle with its vertex inside the circle is half the sum of the intercepted arcs. The following video shows how to apply the formula for angles with vertex inside the circle to find missing angles. The measure of an angle with its vertex outside the circle is half the difference of the intercepted arcs. The following video shows how to apply the formula for angles with vertex outside circle to find missing angles. This video will go through a few examples of how to use the formulas involving Arc and Angle Relationships to find the measure of missing angles or missing arcs. If two inscribed angles of a circle intercept the same arc, then the angles are congruent. Am inscribe polygon is a polygon with all its vertices on the circle. The circle is then called a circumscribed circle. If a right triangle is inscribed in a circle, then the hypotenuse is a diameter of the circle. Conversely, if one side of an inscribed triangle is a diameter, then the triangle a right triangle, and the angle opposite the diameter is a right angle. Proof showing that a triangle inscribed in a circle having a diameter as one side is a right triangle. A quadrilaterals inscribed in a circle if and only if its opposite angles are supplementary. How to use this property to find missing angles? How to find missing angles inside inscribed quadrilaterals.